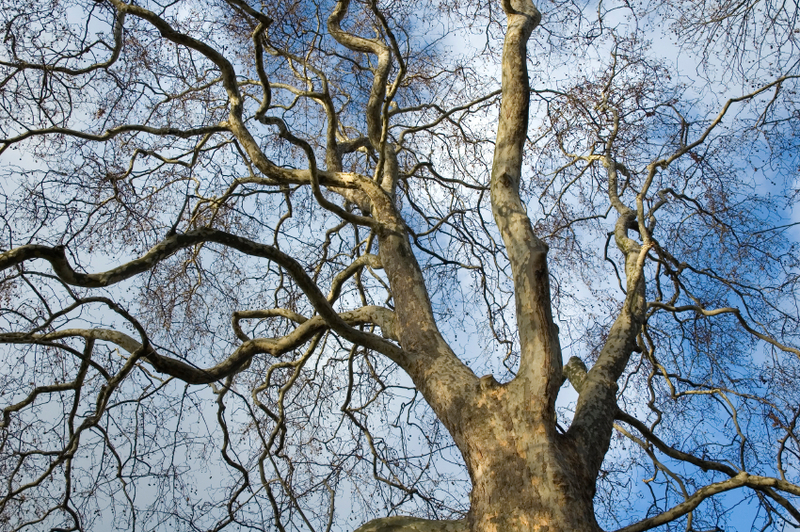 London Plane Trees are said to be trees of the Old World. They have hard coarse-grained wood used for barrels, boxes, cabinetwork, butcher blocks, and furniture. Eastern Native Americans used the trunks for canoes. One canoe was reported to be 65 feet long and have weight over 9000 pounds. The scientific name for this tree comes from the Greek platys, which means “ample” or “broad,” and can be applied to either its individual leaves or its spreading crown. Acerifolia clearly refers to the leaves which are maple-like in appearance. The London Planetree is believed to have resulted in a cross between the Oriental Planetree from Asia – southeastern Europe and our American Sycamore. Moist well-drained soil is best for this tree. Round balls about 1 inch in diameter and made up of tightly compacted seeds. Usually 2 per stalk, but sometimes 3 or single. Multiple seed balls distinguish the London Planetree from the American Sycamore, which is characterized by only one seed ball.